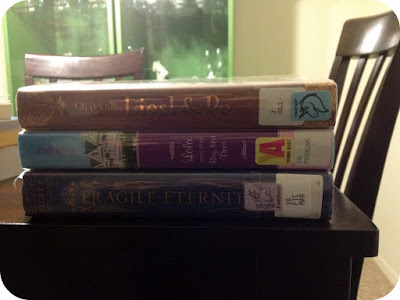 The Readathon TBR – my books. my life. Dewey’s 24-Hour Readathon is tomorrow and I am so excited that I am breaking my blog silence to share my reading piles with you. There is still time to sign up if you’d like to participate. I promise you, it is more fun than you would expect. This year I took a very short-and-easy approach when picking out my books because even a regular YA novel will take me 6 hours and that gets a little frustrating when everyone else is finishing book after book and I’m still reading my first one. Are you participating in the Readathon? What are you planning to read? Next Article The Readathon is Here! I signed up as well and know I just won’t have as much time to read as I’d like so I’ve got a couple skinny books on my list! Graphic novels are perfect for readathons. Wish I would have planned ahead a little for that. I am not a fast reader, so my books have to be short, otherwise I feel like a loser! I am unofficially joining the readathon, and haven’t yet picked my books. I am not sure what I want to read, but have a few ideas. This will be my first time participating, and I am so excited! I have told my husband there will be no food cooked from my hands during this time period. He is still sort of pouting! Have a lovely readathon! The Phantom Tollbooth was one of my absolute favorite books growing up. Enjoy! 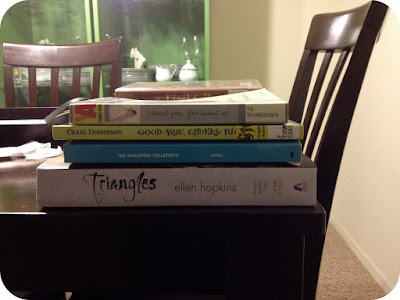 I’m so excited about the read-a-thon and just posted about my stack too. fragile eternity!! stick it out through that book. it was probably my least favorite of the series. the next two are pretty badass. Oh totally–short and easy is definitely the way to go! I’m bad and haven’t planned out my reading yet, but I have a blog tour book I need to finish by next week (eep! ), so that’ll probably be it. I’m going to be cheerleading later at night. I’ll stop by to offer some encouragement. I wish I could read all day. Stupid work! The Phantom Tollbooth is great. It’s the 50th Anniversary so I think I might read it again (haven’t read it since childhood) and watch the film as well. That looks like a great stack: very cozy and readable. I’ve definitely picked too many big books, but I had a plan in mind, and I’m sticking to it. I love Goodbye Chunky Rice! It’s a book that you either love or hate. Happy reading! There are soooo many good reads in your piles! Liesl & Po is fantastic, and graphic novels are a great way to give your readathon stats an ego boost (I have several in my pile). I haven’t read I Heart You, You Haunt Me, but it sounds great and I’ll be picking it up as soon as I can. Tomorrow I’m reading, cheering, hosting a mini-challenge and no doubt tweeting endlessly. Good luck to you and have fun!